AMT Patch Version 1.5 No Upgrade - U.S. Rep. John Boozman (R-AR) today voted to protect American business owners from a needless tax increase under the auspices of “tax relief.” Boozman voted against the latest House version of a one-year patch to the Alternative Minimum Tax which includes nearly $56 billion in tax increases. Today’s vote follows a November House vote which patched the AMT with $70 billion in increased taxes, and comes on the heels of a bipartisan Senate vote to patch the AMT with no tax increase. “The first version of the AMT patch failed, and Version 1.5 is actually worse. While still containing a massive tax hike, it further delays billions in refunds due American taxpayers – another day without dollars that can pay down personal debt, college tuition or housing costs,” Boozman said. “While refunds are being delayed, there are still 23 million middle-income earners that are threatened with a tax increase that was never intended to affect them unless we can pass a bill which can become law. 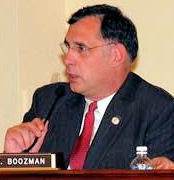 Tags: AMT, Arkansas, John Boozman, US House To share or post to your site, click on "Post Link". Please mention / link to the ARRA News Service. Thanks!